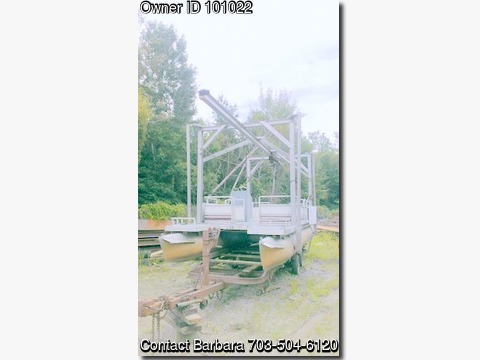 24’ DECKED ALUMINUM WORK BOAT, PONTOON HULL, SPUDS AND 2 TON FULL LENGTH HOIST, WITH TRAILER $8,800.00 WASHINTON, DC AREA Boat has added flotation under deck to offset effect of heavy hoist loads. All added hoist framing is welded aluminum. Boat is powered by 30 HP Johnson motor (recently overhauled – documentation is available). Deck and all other wood elements have recently been replaced with marine grade plywood. Motor, battery, fuel tank, and gang box are not visible in pictures because they are stored indoors. Shallow draft and trailer-able characteristics make boat ideal for projects in lakes and rivers that are inaccessible or economically impractical for normal barge mounted marine equipment. Boat and trailer are being sold as is, where is.